We are trying to evaluate Eon mode database. First, I installed a 3 node cluster deploying vertica.deb's at each node and after running install_script -s option. After that I created a Enterprise Mode Database through admintools. After some test, I decided to drop the Enterprise Mode database and create a Eon mode database through admintools also. But, after inform all the information to create database and hit ok, admintools return a error informing that it can't access the S3 repository. So, I created once again a Enterprise mode database, setup the S3 backup and started. Just works! I check that the problem is not my access to S3. So I decided to uninstall vertica in all nodes, installed the deb again, install Management Console and one of the Nodes and create the Vertica Cluster through MC choosing EON Mode cluster. But failed again. MC does not allow me to create a Vertica Cluster. Just that! If someone can help that will be much appreciate. Make sure that the instances have access to the S3 bucket via an IAM Role from the AWS console. 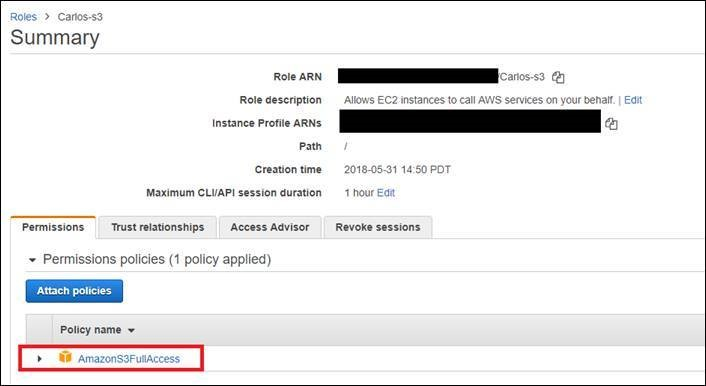 This role must provide S3 Read/Write access and MUST be assigned to the EC2 instance you are running. Then you can proceed to install manually using admintools. Currently we support EON mode only on AWS. You can either use AMI or CFT's to install vertica in EON Mode. I understand, but why I can't use my own AMI? I'm trying to run a EC2 with Ubuntu 16.04. Sorry if I created confusion. I meant we need to use Vertica AMI's provided by Micro Focus from AWS Marketplace. How did you build your own vertica AMI? I choose a Ubuntu 16.04 image, put 2 volumes: 50 Gb for OS and 600Gb for /opt. Then I installed vertica at /opt/vertica, catalog on /opt/catalog and data on /opt/data. And followed the vertica's installation checklist. Well, I tried all I could to launch a Eon mode vertica cluster. I tried the "Vertica BYOL Amazon Linux" image, create a cluster with 3 EC2 using that image, but it don't have the Management Console, so I did installed manually. After, I launch the MC and the option to create a cluster was not available. So, I tried the "install_script" and after that, admintools and create database with Eon mode selected. Didn't work either. So, I terminate the EC2 that I just created and tried "Vertica BYOL Amazon Linux" using the option "Management Console with 3-node Eon Cluster". But, came a option to inform a template that I dont know how to do. I don't know how to proceed from now. @LenoyJ , thank for your answer. That's the information I was lacking. I think this information will be valuable in the documentation. @SruthiA , thank for your help.